So what about that Lanesplitter skirt I was going on and on about? I’d been steadily knitting away on it, and on Saturday afternoon, I finally reached the number of rows that I’d calculated my finished skirt should have. It’s basically a tube, so it’s the same width at the bottom, the top, and around your hips. The pattern calls for 0-6 inches of negative ease. I planned about 4″ of ease. When I got to that point, I pinned it together and tried it on. Um. Well, it looked like what it was: A tube top for my rear end. Which is to say: Not a good look for me. Now, what I really should have done at that moment (since hindsight is always 20/20!) was to put the skirt on waste yarn, give it a nice long soak in some Eucalan and block it out a bit. Had I done that, I probably would have felt the yarn soften and relax a bit, and when I pinned it in place again, it might not have looked quite so… unflattering. But as I said, that’s what I should have done. What I actually did was to add about 8 more rows and try it on again. It seemed a little better, but not quite, so then I added another 7 rows (you can tell where this is going, can’t you?!). Then I grafted the seam shut. Noro SG does not like to be frogged. It sheds so much, it’s practically self-grafting. I pulled my yarn free, but the stitches were still so stuck together, I couldn’t figure out where the previous rows were. More non-ladylike language followed (under my breath, so the kids couldn’t hear). I ripped, both in the knitting sense and in the literal sense. Tried to redo. More ripping, more cursing. Contemplated turning the whole thing inside out and using my sewing machine to seam it up. Decided that might be cheating. Ripped and cursed and growled. The kids thought about bothering me and decided that might not be such a wise decision. I finally got the whole thing ripped out and the stitches back on the needles. Then I got the locking stitch markers and placed one every 10 stitches. Ran out of those and substituted safety pins. And finally, finally, finally, I was able to graft the seam shut. So then I tried it on again. It fit across my bottom, felt a little clingy around my thighs, and gaped about six inches away from my waist. Now how the heck was I supposed to fix that?! The pattern calls for you to pick up stitches around the waistband, knit two inches of 2×2 ribbing, and then fold it over and run elastic through the waistband. I decided to soldier on ahead. I picked out some black sport-weight sock yarn (anything but Noro at this point! 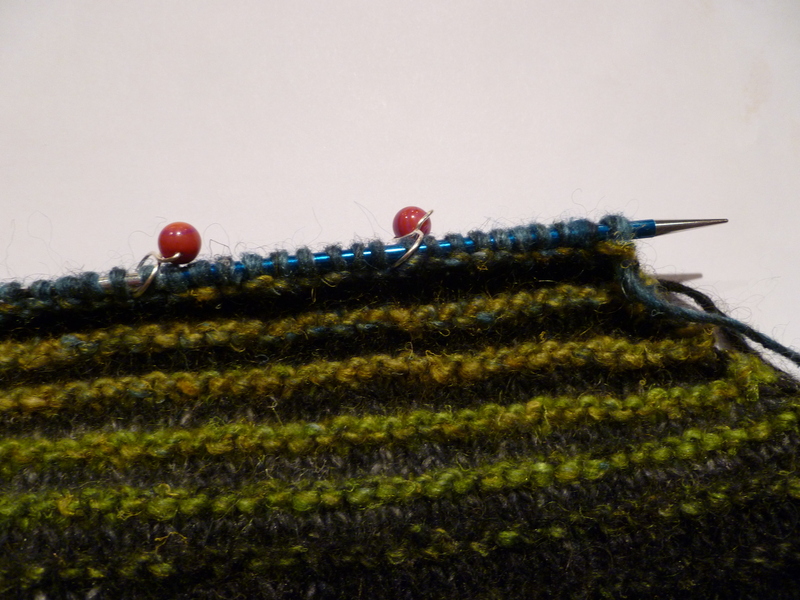 ), picked up my stitches, and started in on the ribbing. After about an inch of ribbing, I tried it on again. Still huge. I tried to make the ribbing fold over and realized that the fabric was pretty thick to begin with, so adding elastic and the ribbed waistband was going to feel like a spare tire around my midsection. Again, not so flattering on my post-kids belly. Okay, so forget the sewn-down waistband. By this point, it was closing in on bedtime, and I still held out a hope that I could somehow salvage this skirt to wear it the next day. I sized up the ribbing and threw in a round of oddly-spaced decreases. Better, but not quite there yet. More rounds, with more decreases. Ribbing was looking seriously malformed now. Finally got to the point where I thought it wouldn’t fall down, bound it off, gave it a quick soak in Eucalan and set it out to dry. So off I went. But here’s the thing… maybe it’s because the skirt was ever-so-slightly damp. Or maybe it’s just because it’s wool and silk and was hanging on my body. But as the day went on, the skirt stretched. Not so much lengthwise as sideways. In other words, it was the first time in my life that I was happy for a slightly too-tight bind off edge, because it was the only thing standing between me and an indecency charge!! Obviously, I need to re-think this a bit. In the car on the way home, I decided that I could rip back the waistband ribbing, start with a k2p4 ribbing and eventually decrease it down to k2p2 ribbing, knit a couple rows plain to fold it over, then work k2p2 ribbing on the inside of the waistband (possibly increasing to k2p3, just to make the seam a bit easier), and put a big loop of elastic inside the waistband. That’s the easier fix. The harder fix would be to take the waistband off completely, undo the kitchener seam (wine and weeping are assumed here), frog the extra rows, redo the seam, then pick up stitches for the waistband as above, without needed to decrease the ribbing so dramatically. If I were to make it from scratch again (and I wouldn’t discount the idea completely; the colors are gorgeous and I did get a bunch of compliments on it, since the waistband was hidden by my shirt! ), I think I’d do short rows every so often, so the stockinette stripe would stop 3-4″ shy of the top of the skirt, thus making the top of the skirt smaller than the bottom. And I’d probably use a lighter yarn; maybe NSG sock. Or some non-Noro yarn, for my seaming sanity! I’m knitting on the Lanesplitter (it might be 60°F and drizzly on Sunday!) and on Haruni (it might be 75°F and sunny! And I’ll be inside, where I won’t need a scarf! But I want to wear one anyway! ), which probably means I won’t be getting either one done in time. I’ve still got 8 rows to go on Haruni, but I’m stopping to place a bead every 7 stitches or so, so it’s slooooooooow going (an hour for one RS row and one WS row, without distractions). (Did I mention that life is nothing but distractions right now? Really, the universe just looooooves to mess with my all-too-limited knitting time.) Plus, it’s dark yarn, with dark beads, so I can really only work on it during daylight hours, while sitting at my (white) kitchen counter. How could I resist such pretty colors?! But in the meantime, I’ve got another knitting project in the germinating stage. I found out that my son’s teacher will be moving away at the end of the school year. She had a baby at the start of the school year, so I’m thinking that I should make a sweater for her daughter. Something cotton (they’re moving to Georgia) and with a bit of girly lace on the bottom. I have two pretty skeins of Ty-Dy Cotton that I picked up a while back that I’ve been wanting to use, and this seems like a good purpose to put it to. I did allow myself to poke around in my library of stitch dictionaries the other day, and I found a scalloped lace pattern that I think would work nicely with the self-striping nature of the yarn. 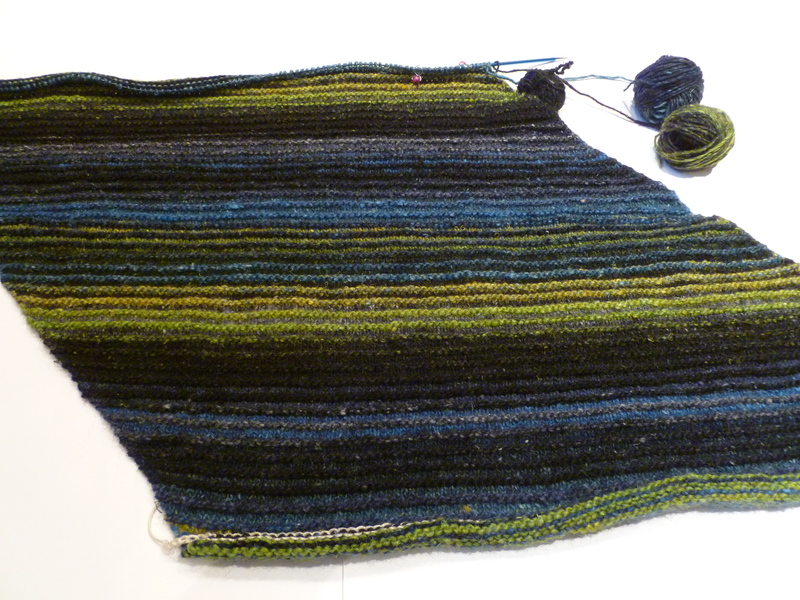 But I’m not going to let myself swatch until these two projects are done, either before Sunday or after. 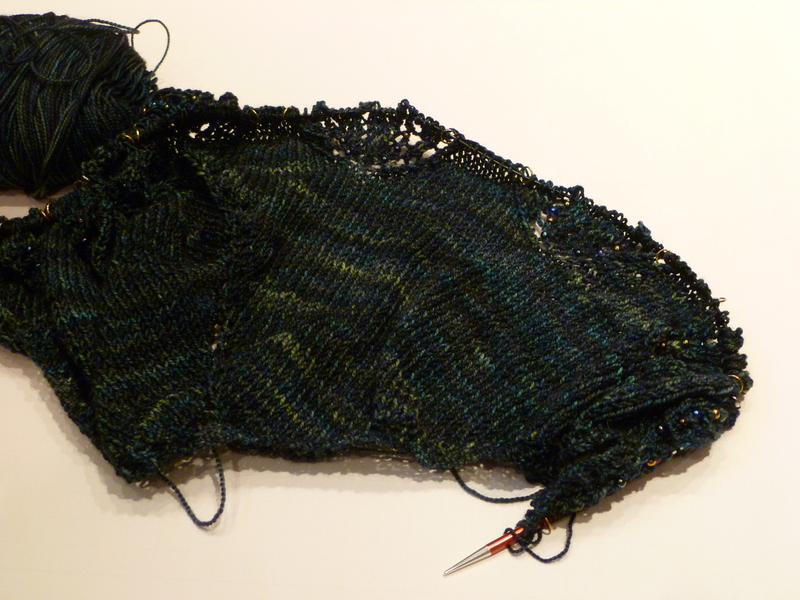 The good news is… I got a chunk of knitting time in this weekend, and I am almost done my Lanesplitter skirt! I could easily finish it in time to wear it on Sunday. See, this is why I prefer to knit cardigans. I frequently wear a cardigan in place of a jacket, since I can pull it on in the morning when it’s cooler, and then take it off and on through the day, as I’m inside or outside or dealing with overactive air conditioning, etc. They are really year-round wear for me. Argh. What’s a knitter to do? Okay, to keep me honest, I’m going to institute WIP Wednesday here at Laura Gets Crafty. Right now, I’m spending most of my time on my Lanesplitter skirt (although as I mentioned yesterday, progress was somewhat derailed last week). I calculated that the finished skirt will have 58 garter-ridges (4 rows each) when it’s done. I have 47 ridges done now. So 47/58 = 81% done. Of course, when I get all the ridges done, I’ll still have to graft the sides together, knit the waistband, sew in the elastic (oops, need to put that on my shopping list! ), and weave in my ends. So let’s say that I’m about 75% of the way through. I haven’t knit at all on my Haruni lately. So no new pictures of that. I have about 10 rows to go, plus the crochet bind off. So let’s put that one at about 75%. Each row (with stopping to place beads every few stitches) takes me almost an hour to knit across and purl back, so it’s sloooooow going now. And really, that’s all I’ve been working on, so let’s leave it at that, shall we? What’s on your needles right now? Yesterday I posted about ambitious knitting. Which got me thinking about why I knit. If you enjoy a craft, it’s usually because you enjoy both the act of doing it as well as the finished product when you’re done. Many knitters are perfectly happy knitting and wearing garter stitch scarves. There’s clearly no obligation to pursue ambitious knitting projects, so why do I? For one thing, I like wearing socks and sweaters and lace shawls, so it makes sense that I’d want to make those sorts of things. And for another… well, I suppose I view knitting as an intellectual exercise as much as a craft. I’ve always loved puzzles and logic problems. Heck, most of my undergraduate & graduate studies were spent problem-solving (mathematics, operations research, and computer science). B.C. (before children), I designed computer software and websites. I guess knitting was a logical progression! Knitting presents an interesting puzzle for me… how do you manipulate yarn to make complex lace patterns or to fit the curves of a human body? The mathematician in me loves problems like that. And the knitter in me appreciates that knitted fabric is nice and stretchy, so dipping into triple integral calculus is purely optional. Case in point: My Lanesplitter Skirt. The original pattern calls for casting on in a corner, increasing on both edges to make a large triangle. When the right side is the length you want the skirt to be, you start decreasing on the right side and continue increasing on the left side. When the left side is as wide as you want the skirt to be, you decrease on both sides back to a point, then seam up the short side to form a tube. Very clever pattern. Before I decided to make one of my own, I spent some time reading the project pages on Ravelry (okay, not all 1,457 of them, but enough of them to get an idea about the pattern). Many people commented that they didn’t like the way the stripe colors didn’t match up at the seam, so they suggested that you start with a provisional cast-on, work only the straight section (decreasing at the start of every right-side row and increasing at the end), and then graft the skirt closed at the end, so you get a seamless tube. This sounded brilliant to me! But how to determine the correct size? I reasoned that we’re knitting a parallelogram (the top and bottom of the skirt will be the same number of rows and thus should be the same size once blocked, and the sides of the seam to be grafted will be the same length). The original pattern called for increasing equally on both sides of the work, so you should end up with a triangle with roughly equal-length sides. This means that you have a 45-45-90-degree triangle. (Sorry if that flashback to geometry class was painful for you!) Which means that the hypotenuse of the triangle is the length of one side times the square root of two (approximately 1.414). So if I want my finished skirt to be 19.5″ long, I need to cast on enough stitches to make approximately 27.6″ of knitting (19.5 times 1.414). My gauge (after washing) was 19.5 stitches per 4 inches, so I needed to cast on 27.6″ times 19.5 stitches divided by 4″ = 134 stitches. 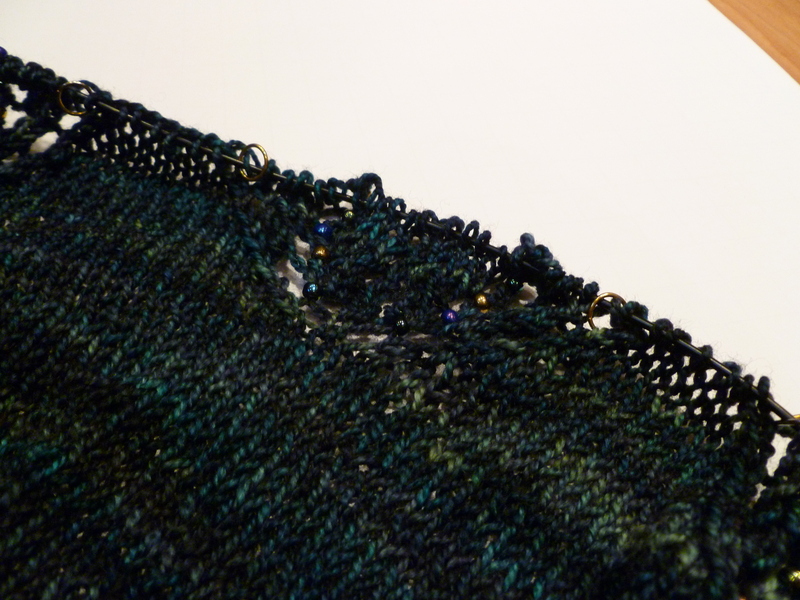 I expected the weight of the fabric to cause the fabric of the finished skirt to stretch a bit more than my gauge swatch, so I rounded down to 130 stitches. I just measured my skirt again, and found that it’s about 18.5″ from one edge to the other. It hasn’t been blocked yet, so with blocking and the way I anticipate that the fabric will stretch lengthwise when I wear it, my skirt should come in right about 19.5″ when it’s done. Yay for knitting math! How do you feel about knitting math? Do you embrace it or avoid it? I’m making progress on the Lanesplitter Skirt. I’m just past the halfway point, which means that I have reached the point where progress is almost imperceptible from row to row. 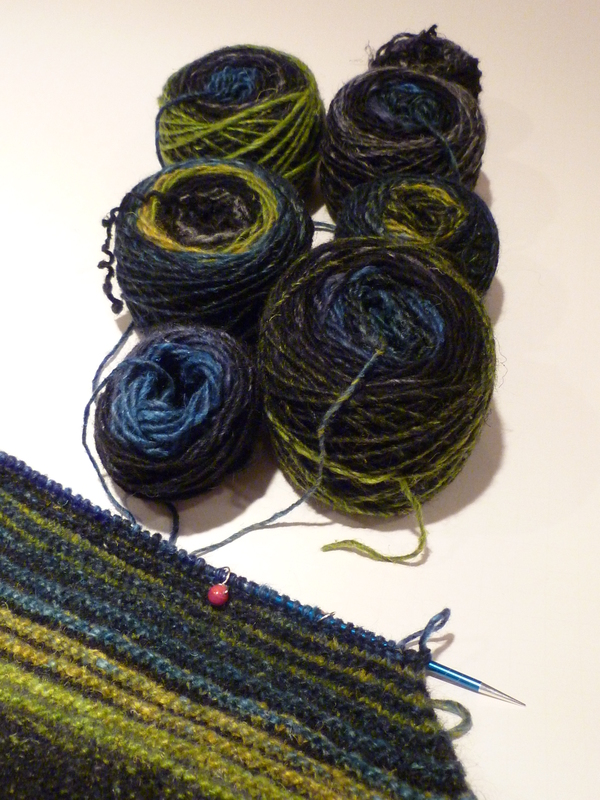 But I am loving the way the stripes are playing out, and therein lies the genius that is Noro. The colors emerge so slowly and gradually, it’s like watching a flower bloom with time-lapse photography. Every knitted row is a tiny bit different from the previous row, and the contrast between the stripe pairs is never exactly the same. I finished the first two balls of yarn, which brought me to the first real crossroad in the project. I needed to join two new balls of yarn to continue the stripe pattern, but I needed to do so in such a way that the colors would match both at the join point as well as continue the color sequence already established. With long color-run yarns such as this, there’s always the possibility that, even within the same dye lot, you won’t have another ball that starts at exactly the right point. And having worked with Noro before, I know there’s an equally good possibility that there will be one or more knots in the yarn, interrupting or even completely reversing the color sequence. I took the remaining yarn and lined the center-pull balls up on the table. Looking from the inside of the ball to the outside, I checked to make sure that all the balls had the color sequence lined up in the right direction. Then I draped the ends of the working yarn over the balls. I was able to find two balls that started in exactly the right color, so I joined those and kept knitting. (For this project, I was not concerned about joining the yarn in any fancy way. The thick-and-thin texture of the yarn ensures that my woven-in ends won’t show. I simply held the new yarn next to the old, knit four stitches with both yarns, dropped the old yarn, and continued knitting.) Then I lined up the remaining yarn and put those balls in order, too. I doubt that I’ll need to go all the way to the last small balls of yarn, and I’d have to do a bit of surgery on one of them (the color at the beginning would partially repeat the color at the end of the previous ball of yarn), but I have more than enough to finish the skirt with the color sequence intact. Good news! I love stitch markers. I use them on pretty much every knitting project. I use them to mark edge stitches, increases, decreases, anywhere I have to remember to do something. When I’m knitting any kind of lace, I put a stitch marker after every single repeat, even if it’s only a few stitches. On the wrong side of the work (often just purling), I count the stitches in each repeat as I work my way across, so I can catch and correct errors (usually missed yarn-overs) before I’m two more rows down the pattern & wondering why I don’t have enough stitches to finish the row. For my Lanesplitter Skirt, I cast on 130 stitches with a provisional cast-on, then worked on the bias. The total stitch count doesn’t change, but at the beginning of every row, you decrease one stitch, and at the end of every row, you increase one stitch. Now this may be the sort of thing that other knitters can remember without any trouble at all, but I know myself well enough to know that at some point, I’ll miss one of those increases or decreases. (Heck, I did that somewhere in my tiny gauge swatch!) So what to do? I could stop every few rows and count the number of stitches on my needle, but I really don’t want to have to count 130 stitches over and over again. Or I could use stitch markers. I used four of them, which I first placed at 5 and 15 stitches in from either edge. After the first right side row, I had 4 stitches to the right side of the first marker and 6 stitches to the left side of the last marker. So at the end of each row, I know that the stitches in front of the first marker plus the stitches after the last marker must equal ten. When I run out of stitches at the start of the row, I move to the next marker, and replace the original marker ten stitches in. (Using the second marker also lets me easily orient one or the other markers if I happen to lose one.) This system has worked like a charm for me; my stitch count has stayed constant, and I haven’t needed to stop and count 130 stitches yet. When I first started knitting, I just used the plastic stitch markers from my local craft store. I lost so many in the sofa that I swore I’d never use the nice, jewelry-like ones that I saw women in my local knitting group using. But then my friend Brenda (a talented jewelry designer) gave me a set of her pretty stitch markers, and I have to admit: I was hooked. 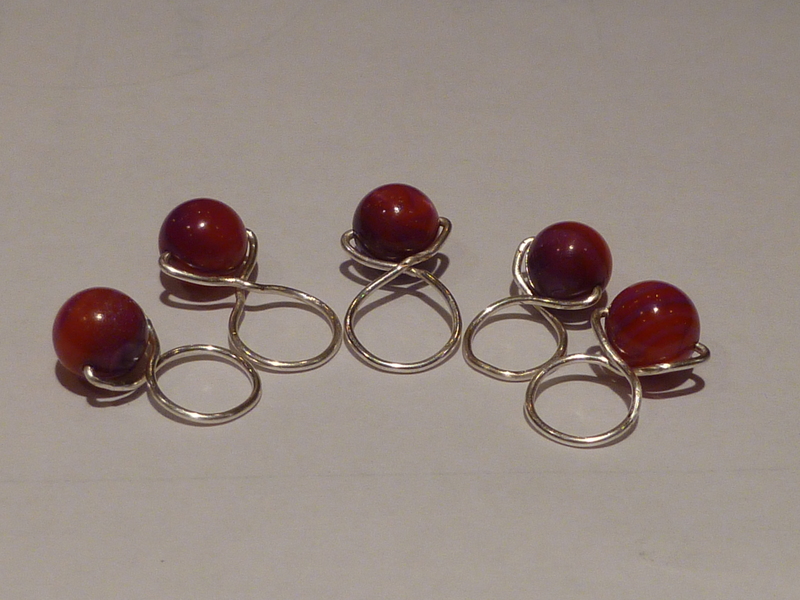 So I bought some jewelry wire and beads and a pair of pliers and I made a set of stitch markers myself. They aren’t nearly as pretty or as beautifully crafted as Brenda’s, but I like them, and I can replace them as needed if my sofa gets hungry. Plus… they make my Lanesplitter-in-progress look pretty, don’t they? Thinking more about knitting philandering (knitting polygamy? 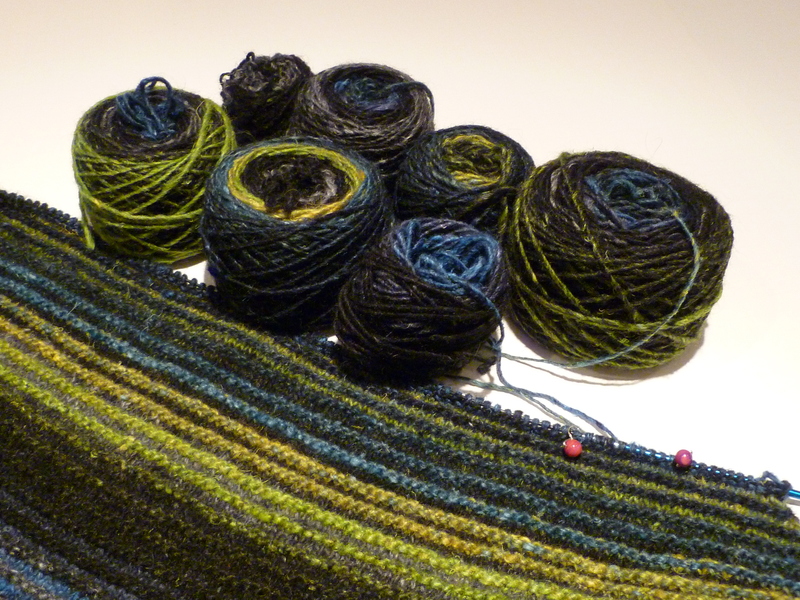 )… Not only does it take longer to finish knitting a single project, there’s a serious risk that as newer and shinier projects come along, the project in question might find itself deeper and deeper in the work-in-progress basket, doomed to never be finished at all. So what’s a knitter to do? How do you stay motivated to actually finish that work-in-progress? I’m using this approach right now on the Lanesplitter Skirt. I want to wear it to the Homespun Yarn Party at the end of the month, which gives me 25 days to knit 156 rows, or about 7 rows per day (to allow me enough time to knit the waistband and block the finished skirt). So far, so good. I’m not a huge fan of knitting with Noro (I find it somewhat hard on my hands), but the colors are entrancing, so I want to keep going to see what the color morphs into next. This pattern is worked in a series of 4-rows (2 rows in one color, then two rows in the next), so getting to the end of the next 4-row repeat is a good milestone. I also use my knitting as a reward. At the end of the day, when the kids are in bed, the dishes are done, and that last load of laundry is tumbling around in the dryer, I get to put my feet up and knit a few rows. To make it sweeter, I often have a DVD or a TV show on the DVR (like Downton Abbey; do I mention that often enough?) to look forward to while I knit. Audiobooks are another great motivator for me. A single audiobook can provide ten or more hours of knitting time. And if it’s a well-paced book, I’m always eager to get back to it so I can find out what happens next. What motivational tools do you use to help you finish big projects? Do you have special tips or tricks that I’ve missed? We’re healthy again here. (Or at least, recovering.) So the knitting has resumed, albeit slowly. I’ve been thinking about knitting monogamy. I used to be extremely monogamous with my knitting. I’d start a project and keep plugging away at it until it was done. I’d carry the same project everywhere with me, knitting on it in waiting rooms, in the carpool lane, at long red lights… pretty much anytime I had enough time to pull my project out of the bag. And then something changed. For one thing, I became a better knitter. Instead of tackling that first pair of socks (just to see if I could do it) or that first hat, I’m an accomplished enough knitter now to know that I am more than able to finish the project. So perhaps I don’t have anything to prove now. And for another… like most knitters I know, I have a (cough, cough) rather long queue of projects I’d like to knit (and the ever-increasing yarn stash to accommodate those projects). So casting-on for one or two (or three or four…) projects makes me feel like I might actually get to them all. Or maybe I just (as the Yarn Harlot says) have a really bad case of start-itis. Whatever the cause, it’s become pretty clear that I’m about as monogamous about knitting as Tiger Woods is about women. But it’s not entirely a bad thing. Some projects are more portable than others. It’s a lot easier to pull out a small sock when you’re sitting in a waiting room than a whole sweater. But a stockinette sweater knit in the round is a perfect television-watching project. 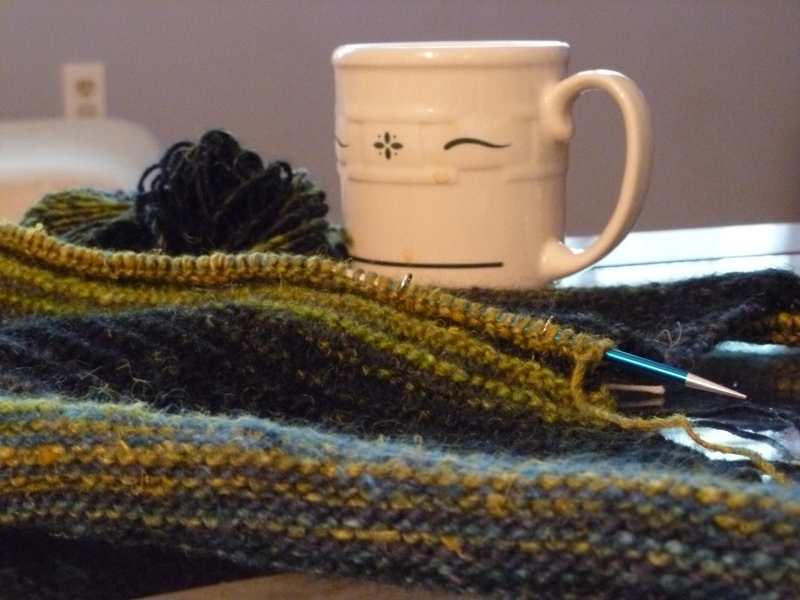 You can knit and knit and knit, without ever taking your eyes off Downton Abbey. And sometimes you’re just not up to a complex project. I love my beaded Haruni scarf, but I’m nearing the end, so I have well over 200 stitches per row. Knitting a single row (pausing every four or five stitches to place a bead with a tiny crochet hook) and purling back takes me almost an hour. And the yarn is dark, and the beads are slippery, so the only place I can work on it is sitting at my kitchen counter, with the lights turned up all the way. Not exactly a good project for the carpool lane! And sometimes you just need to take a break. After an intricate row on the Haruni, the simplicity of my Lanesplitter (knit three rows, purl one) is a breath of fresh air. And when I get tired of picking vegetable matter out of the Noro Silk Garden, going back to the lovely, tight plies of Sundara’s Sock Yarn is an equally welcome change. The biggest downside to this arrangement is that it makes for rather slow progress on the individual projects. I’d love to post more pictures of my works-in-progress, but honestly, they look pretty much the same. A few more rows, a few more beads, neither still bearing much resemblance to the finished items they’ll become. So I suppose knitting philandering requires a bit more patience on the part of the knitter (and also the recipients of the knitted items, if they’re destined for others!). How about you? Are you a monogamous knitter? Lace looks like yarn vomit while it's still all mushed-up on the needles, doesn't it? Sigh. I’m sick. Again. For variety, this time it’s a stomach bug instead of a head cold. I’m not any more thrilled about it. I pulled out a long-languishing project from my WIP basket the other day, a beaded Haruni Shawlette. I am, of course, modifying the pattern all over the place (adding beads, using a plain Ishbel-esque body, and re-working the petals at the end to make the most of the limited yarn I have to work with, some yummy Sundara Sock Yarn in the limited-edition Lunar Landing colorway). But it’s gotten to the tricky bits near the end, and once again, I am just feeling too stupid to tackle them right now. Look! Yarn vomit with beads! I tried to take some pictures of the beads, but it’s pretty hard to get them to show up. And the colors look rather horrid, despite my best efforts to futz with my camera settings. 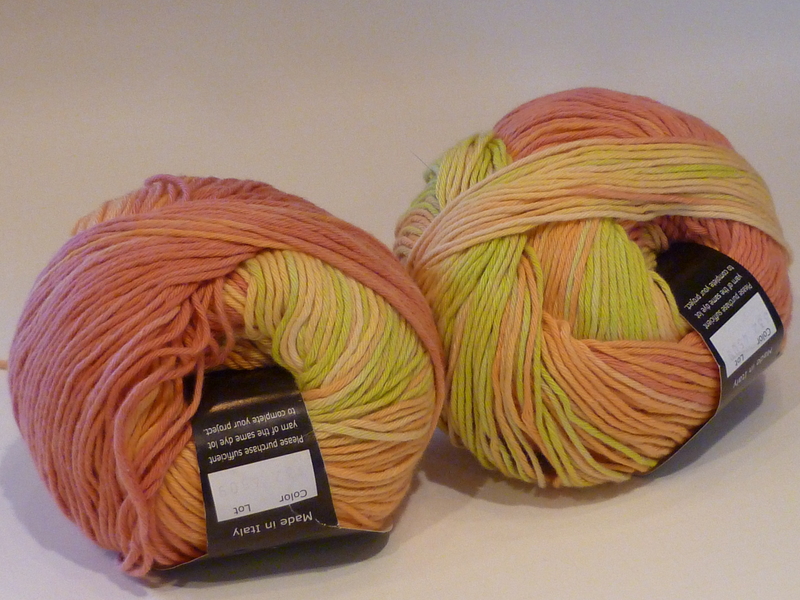 Believe it or not, this is the same yarn you see in the blog header. Fortunately, the Lanesplitter skirt is much simpler, so I am going to keep going with that for now. It looks pretty much the same as last time, so I didn’t try to photograph it again. And I’m still plugging away at the linen stitch scarf. The ball of yarn doesn’t seem to be getting any smaller. I think it’s taunting me! Hopefully next time, I’ll have more progress to show.